The stampede began almost immediately — just as retiring Sen. Barbara Mikulski predicted. The savvy senior U.S. senator knew her announcement last week would shake up political Maryland and give ambitious younger officials an opportunity to consider entering the race to succeed her next year. Many are mulling the possibilities, but in the end most will choose to remain in their present jobs. After all, running for Mikulski’s seat is no sure thing. These contenders have to weigh the risks, which are considerable. Do you give up a prestigious, hard-won seat and gamble your entire career that you can win a difficult, crowded Senate contest? Can you put together a statewide operation in a little over a year after only running far smaller district campaigns? Can you raise $5 million or more in the next 12 months when others are likely to hit up the same donors with similar requests? Can you run a campaign with statewide appeal? That’s no easy feat. Washington-area officials and Baltimore-area officials are looking at this race but none has appeal outside his or her parochial boundaries. Given those imposing caveats, let’s look at the early list of wannabes. Chris Van Hollen, Jr. — He’s popular in heavy-voting Montgomery County. He’s been tabbed as a rising star in both the Maryland General Assembly and U.S. House of Representatives. His ambitions always have included ascending to the U.S. Senate. Unlike the others, he’s had phenomenal success raising tens of millions of dollars for Democratic congressional candidates across the country. He can tap those same sources for a Senate race. He starts with $1.7 million already in his campaign account. Giving up his seat won’t be easy because he’s a member of leadership and could be speaker of the House one day. But he already has a campaign organization in place. Van Hollen, 56, is likeable, an excellent speaker and telegenic. He’s a typical Montgomery County liberal, which puts him in the mainstream of today’s left-leaning state Democratic Party. He’s also gained enormous expertise on federal budget issues. He could be the class of the field. John Delaney — He used his self-made multi-millions to finance a successful run for the House in 2012, thanks to a gerrymandered district that favored a Montgomery County Democrat. Yet he barely won reelection last year. Still, he’s got burning ambition and he considered running for governor last year. Given his shaky performance in last year’s congressional election, Delaney, 51, may figure it is time to move up or out. He’d have no trouble financing his Senate campaign but he is unknown in much of the state. His campaign also is likely to be run by the same individual who put together such a dreadful political operation last year for former Lt. Gov. Anthony Brown (and who ran Delaney’s first campaign). Delaney has carved out a moderate, pro-business posture in Congress focusing on his sensible infrastructure-funding bill that has drawn support from both sides of the aisle. That’s not a good campaign sound-bite, though. He may well run — since he’s not a career politician — but he won’t be the favorite in a Democratic primary where a heavy turnout among liberal voters is expected. John Sarbanes — The son of a popular retired U.S. senator who has been in Congress three terms, he’s a chip off the block — quiet, publicity-shy, intelligent, diligent and super-cautious. At age 52 he’s got to determine if he wants a long career in the House of Representatives or is he willing to roll the dice and possibly sacrifice his political future. His father, Paul, took the leap but the odds are less favorable now. John Sarbanes could tap into the affluent Greek-American community for campaign funds, but does he want to spend all year begging donors to contribute and flying around the country to line up financial support? His name is well known in the Baltimore region, but not so much elsewhere. Sarbanes is a solid liberal vote in Congress and he’s a down-the-line Democrat but his bland personality and cautious disposition aren’t ideal in a crowded race. Donna Edwards — The most liberal of Maryland’s congressional Democrats, she owes her political career to her strong ties to organized labor, which would go the extra mile if she runs for the Senate. But does she want to risk her prominent role in Congress as an outspoken voice for labor, civil rights and women’s issues? She has much the same decision to make as John Sarbanes. Edward, 56, is not beloved by her colleagues and she is not wildly popular among constituents, who have found her lacking on constituent service. She would rather speak out loudly on national issues she cares about. If she is the lone African-American in the race, the lone woman and the lone far-left candidate, Edwards might squeak through in a crowded Democratic primary. But her strident liberalism would turn off many statewide voters and make it difficult for her to win in a general election if Republicans nominate a moderate Senate candidate. Stephanie Rawlings-Blake — Baltimore’s mayor has a huge decision to make. Does she abandon her so-far successful effort to resurrect Baltimore’s fortune or does she set her eyes on a career in Washington? Rawlings-Blake, who is only 44, has been an elected Baltimore official for 20 years. She would roll up a big vote in Baltimore and in parts of the metro region but she’s an unknown in the D.C. suburbs and rural Maryland. She’d also start with zero funds in the bank — none of the dollars she has raised for her reelection bid next year can be used in a federal campaign. That’s a huge detriment. Running a complex and troubled city like Baltimore while simultaneously mounting a statewide Senate campaign might be a bridge too far. Compounding her decision is that there is no highly competent successor waiting in the wings to succeed her as mayor. Apres moi, le deluge? Dutch Ruppersberger — If he were 10 years younger, the Baltimore County congressmen would be in the “likely” category. But at age 69, with a succession of surgeries over the years, taking on a grueling statewide campaign while maintaining his normal congressional schedule might not be his cup of tea. Ruppersberger’s huge popularity in Baltimore County and his district’s reach into key parts of the Baltimore metro area would give him a solid vote base. How he would fare in the Washington suburbs — where he’s not a familiar face — is a tougher question. Raising such a large amount of campaign dollars isn’t something Ruppersberger would relish, either. He’d also have to give up his House seat, where he is one of the leading experts on cyber security. Chances are he opts to remain where he is. Elijah Cummings – The Baltimore congressman has never ventured beyond district races, but he is a fiery speaker and a determined fighter for Democratic Party ideals. If he were the only African-American considering the Senate race, he’d be tempted. Putting together a statewide operation and raising such giant sums of money could be distasteful and difficult. Cummings, 64, is unfamiliar with much of the heavy-voting Washington suburbs but he’d do exceptionally well in Baltimore. He’s a national spokesman on liberal and civil rights issues in the House and often in the national spotlight. Why give that up? Tom Perez — The Obama administration’s labor secretary and former high-ranking Justice Department official wanted to run for attorney general but couldn’t because he hadn’t practiced law in Maryland. He is ambitious and well-liked in his home base, Montgomery County, but his support could be too narrow. He also could have trouble raising enough dollars. Would he give up two more years in a national Cabinet position for a longshot bid? It’s possible but not likely. Kweisi Mfume — The former congressman and former head of the NAACP tried once before to win a Senate race, narrowly losing the primary to current incumbent Ben Cardin nine years ago. Mfume, 66, might jump at a second chance to start a Senate career were he a bit younger. He’s eloquent and has a riveting life story to tell. But fundraising was a problem in his last Senate attempt and he’s not been part of Maryland’s political dialogue since then. Martin O’Malley — The former governor and Baltimore mayor would have been a favorite but instead opted to run for president (really!). He loves the executive role and knows he would chafe in the Senate with its snail’s pace and bitter partisan gridlock. If he plays his cards right, O’Malley, 52, could gain a high executive post in a Democratic administration and build his credentials for a future run for the country’s top post. Steny Hoyer — At age 75, it makes sense for the No. 2 Democrat in the House of Representatives to stay put. He ran once on a statewide ticket, in 1978 as lieutenant governor, and lost. He knows how tough it would be. Besides, Hoyer is far too valuable to Maryland in the House. 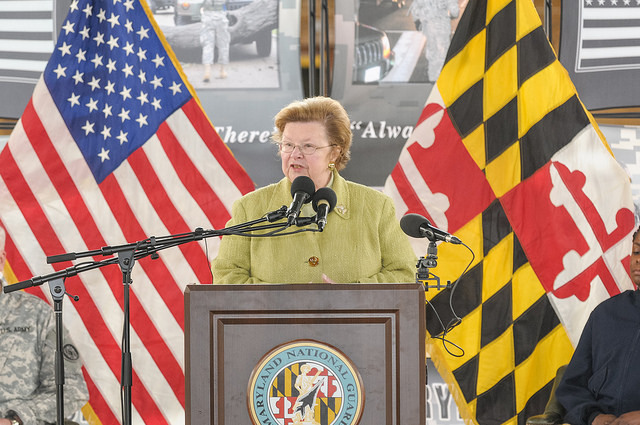 With Mikulski’s departure from the Senate, he’ll be the only “go-to” guy in Congress in prime position to secure funds and advantages for the Free State. Heather Mizeur — Yes, the former delegate ran an impressive and respectable race for governor last year as an ultra-liberal but now she’s supposedly farming on the Eastern Shore. Her appeal is to the gay rights/environmental/feminist community. That proved not nearly enough for her last year (roughly 20 percent of the primary vote). Does she want to spend 12 more months trekking through Maryland on a crusade going nowhere? Ben Jealous – Another former leader of the NAACP, he is considering jumping into the race. It would be primarily ego-driven. Jealous has no political roots in Maryland and the most tenuous of ties to the Free State. He’s not well known in any part of the state. Even if he is the only African-American in the race, Jealous is unlikely to prove a big draw among his own constituents. In other communities, he’d barely register on Election Day. Doug Gansler — Yes, he still wants to run statewide again — though he was embarrassed in last year’s race for governor, getting embroiled in pointless controversies. The two-term former attorney general is just starting a career with a Washington law firm. Jumping back into fund-raising mode and 24/7 campaigning so soon may not be his best option. Ken Ulman — The former Howard County Executive gave up his gubernatorial dreams last year in part because of the fund-raising challenge. Running for the Senate would pose a far bigger financing obstacle. Besides, he’s just beginning his new job trying to juice up College Park’s economic development efforts. Anthony Brown — Yes, he says he’s interested but who cares? The former lieutenant governor ran such an abysmal race for governor last year he’d be hard-pressed to explain why he should be elected to the Senate. Additionally, he is personally liable for $500,000 in debt from that campaign. Who in the world would fill his campaign coffers this time? Kathleen Kennedy Townsend — Whaaa?? She says she’s looking at the Senate race. It sounds preposterous given her pathetic run for governor in 2002 and the lack of political sympathy for her poor performance. Still, politics is in the Kennedy family’s DNA. Townsend, 63, may want to redeem herself but she has been absent from Maryland politics for over a dozen years. It would be a Quixotic effort almost certainly ending in a humiliating second defeat. That takes care of the likely Democrats considering a Senate race. As for the Republican wannabes, that is grist for another column.